We have been watching the Lake Winnipesaukee Market very closely and through the first quarter of 2012 the trend continues to be more sales in the lower end. Having the volume of sales increase shows that demand is still there for waterfront properties, so values will follow. The other sign of recovery is the volume of sold listings, we saw the total volume of listings sold jump from $8,657,000 to $9,835,000 in the first quarter of 2012 as compared to 2011. June is first of the big closing months in the Lakes Region, so we will soon see what type of year it is going to be. I have heard of a number of properties going under agreement and anticipate some more positive movement. 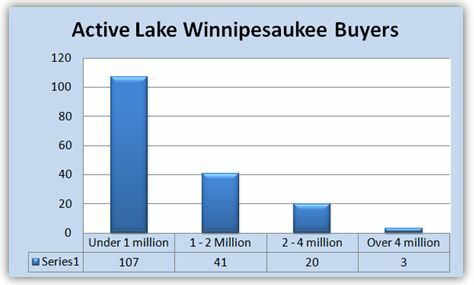 I sent a survey to 350 realtors in the Lakes Region requesting the number of "Active Lake Winnipesaukee Buyers" they were working with as clients. I stressed active because I wanted the number to be relevant to the current market place. The results were interesting and prove there is a pent up demand. There are 171 people actively looking for a special spot on the Lake. This number represents just under 10% of the realtors responding to the survey.